Product prices and availability are accurate as of 2019-04-24 15:29:54 UTC and are subject to change. Any price and availability information displayed on http://www.amazon.com/ at the time of purchase will apply to the purchase of this product. The Bruder Mack Granite Flatbed Truck with JCB Loader Backhoe is one of the larger models in trucks that can carry heavy equipment to transport to the next play site. The truck comes with moveable parts to make it more realistic looking. Let’s take a closer look to see what else this two-piece toy has to offer your child. 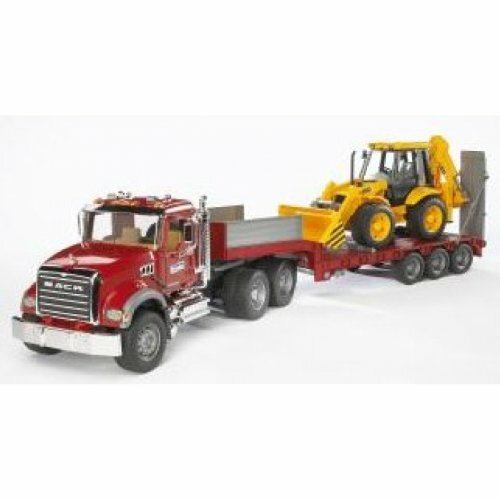 Is the Burder Mack Granite Flatbed Truck with JCB Loader Backhoe Worth Buying? 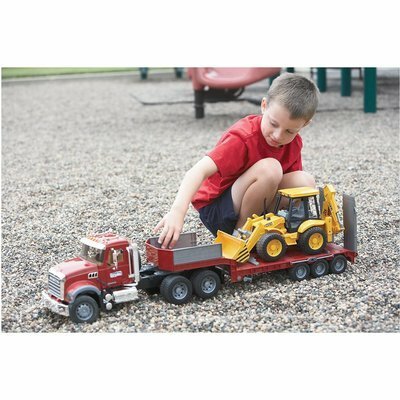 This is a fun toy for your child to play with outdoors, where he or she can run the truck and loader backhoe through dirt, gravel, and on concrete. 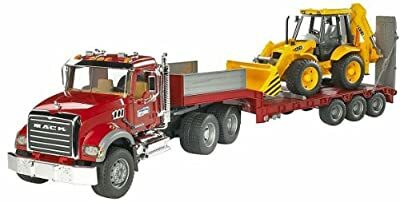 You may be wondering why a toy truck costs so much money, but understand that this is a very detailed truck and it’s a very special gift for any child who loves construction toys. 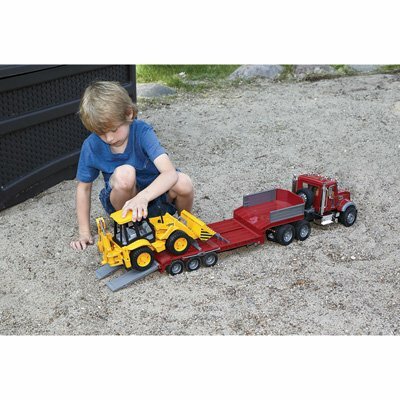 This toy allows your child to load their JCB onto the back of the truck, ready to be transported to any construction site and get to work! In addition there is a trailer that is detachable with removable side gates. The truck is designed to be played with indoors and out, and the wheels can easily run over small rocks or uneven surfaces. The fold down ramp can be connected to chains to unhook folding mirrors, and your child can also play with other realistic features like the opening of doors, folding support bar, and a locking device. It also has a tilting cab where your child can actually view the impressive engines that lie underneath. The backhoe is also able to move up and down, and can swing side to side. One thing to know is that this well-detailed truck is not made to receive constant abuse from being dropped or dragged. It just can’t withstand excessive abuse. So it is more appropriate for children who are 5 years old and above, and able to respect his or her toys when being used. You may also need to show your child the proper way to use this toy. Overall, this is a great toy for the older child who loves trucks and heavy equipment or it can be stored as a collector item. For the high price, it is only worth buying if it will be cared for, or for children who appreciate real attention to detail in their toys. It is not worth buying for the younger child who doesn’t appreciate construction toys.